I drove the 20 minutes to a small family orchard the other evening and picked peaches as a full moon rose over the mesas in the distance. Sound enchanting? It was. The smell of the sweet fresh air, as well as some good company and expert advice on how to pick the best peaches from the 18 year old daughter in charge of peach sales made it even more so. She asked what I planned to do with all these peaches? I was surprised that her family only dried or froze what they needed from their harvest. So, I told her all about peach pie filling sweetened with honey, fruit leather, and peach jam - and while I may not look it, I have an old soul that loves doing things the way my grandma and her grandma did (with maybe a few health-improved variations). First, most jam recipes call for loads of refined sugar. Excessive sugar consumption is a major culprit for blood sugar handling issues, weight gain, and plays a role in the progression of a host of ailments and regulatory responses in the body. True, honey is a form of sugar too. However, it differs in some significant ways that your body can distinguish. Chemically, refined sugars are made of fructose and glucose. But in sugar they are bound to make sucrose, which must then be broken down (i.e. sugar high, insulin spike, addictive response in the brain, etc). Honey on the other hand, is also composed of mostly fructose and some glucose, but unlike sugar they are not bound. This means that honey is digested and absorbed differently and there is even some evidence which shows it could lower blood sugar levels. Because honey is mostly fructose it's actually sweeter than sugar, so you don't need to use as much to get the same amount of flavor - thus less calories. Pectin is made of soluble fruit fibers and in it's true form is very healthy to eat - it's true form being in fruits and other plants. The trouble comes due to the fact that almost all commercial pectin is made from genetically modified (GMO) fruits that have been heavily treated with chemicals. The pectin actually has nothing to do with the preservation of the jam/jelly and is simply a thickening agent. There is pectin already found in most fruits so you really don't need it except as a thickening agent. That's where grass-fed Beef Gelatin Natural Powder comes in. Gelatin is basically just dehydrated beef broth powder made from bones, cartilage, collagen, and all the vitamins and minerals found in them (don't worry it is tasteless). Gelatin from organic, grass-fed beef doesn't have any of the hormones, antibiotics, and harsh treatment that their non-grass-fed counter parts have. All that gelatin and collagen goodness can promote skin, hair, and nail health, liver and mental health thanks to amino-acids, and digestion as well. Simple ingredients with no refined sugars or pectin. This recipe is clean eating, organic, paleo, and autoimmune friendly. Oh, and it's so yummy! 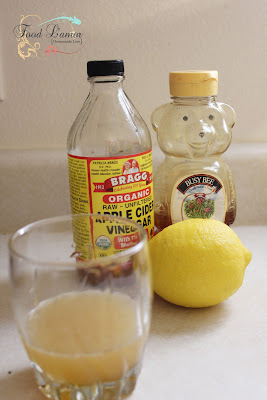 In a small sauce pan on the stove heat the lemon juice, water, and honey if using.